Work continues apace as Orchard and Broome Streets turn into 1970s Little Italy for the upcoming filming of The Irishman. Directed by Martin Scorsese, the Netflix film stars Robert De Niro, Al Pacino, Harvey Keitel and Joe Pesci. Yesterday we showed you the replica of the original Umberto’s Clam House. The mob favorite, at 129 Mulberry Street, at Hester Street, was where gangster Joey Gallo met his fate. Era-correct yellow street signs that will be used for the film show the attention to detail Scorsese is famous for. Many of the other faux storefronts also depict real businesses. Forzano Italian Imports and E. Rossi Italy Music & Book, from Friday’s story, were Mulberry Street mainstays back in the day. Click through our slideshow to see the latest reveals. The transformation of Orchard and Broome Streets into the Little Italy of the 1970s continues in preparation for the filming of The Irishman, director Martin Scorsese’s mob drama on the disappearance of labor boss Jimmy Hoffa. This week Lower East Side hipsters may fret that the neighborhood’s invasion of piercing salons and beard-trimming shops has come to an end. Storefronts on Orchard and Broome Streets sport signs reminiscent of 1970s Little Italy. Signs for E. Rossi’s Italy Music & Book Co., Vitale Funeral Home, Hester Discount Hardware and others have popped up, seeming to herald a comeback for the mom-and-pop shops the man-bun crowd has shunned. But don’t worry, the shops will be gone soon. 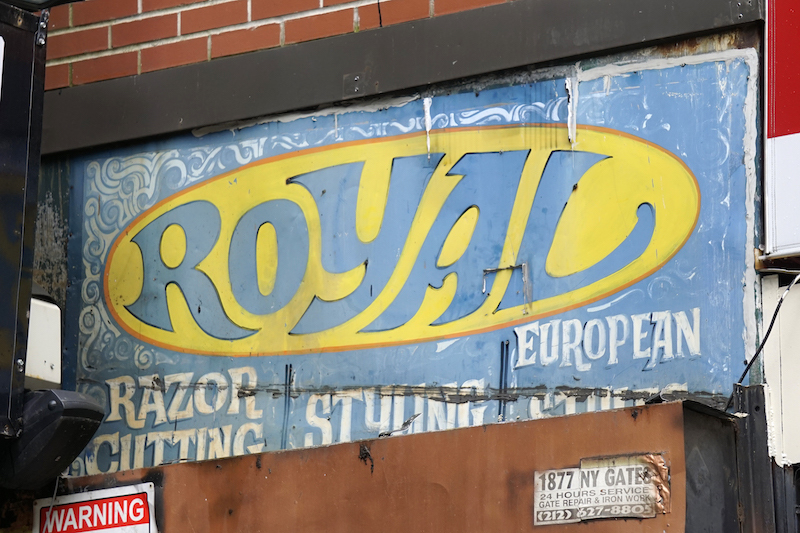 The signs are props for the filming of The Irishman, the upcoming Netflix film that examines the disappearance of union boss Jimmy Hoffa in 1975. The flick stars mob drama heavyweights Robert De Niro, Al Pacino, Harvey Keitel and Joe Pesci. It reunites De Niro and Keitel with Martin Scorsese, who directed the pair in another LES drama, 1973’s Mean Streets. Based on the 2003 book I Heard You Paint Houses by Charles Brandt, The Irishman marks Scorsese’s long-awaited return to the gangster genre. Shooting began here in August and will continue through December, just in time for SantaCon to arrive. It is appropriate that the Village Voice ends its print run today with a photo of Bob Dylan on its cover. Like the Voice, which launched in 1955, Dylan also got his start in a Greenwich Village filled with coffee houses and small clubs that featured poetry readings and folk music.